Ramen is the kind of meal I like on cold and wet nights, and that's exactly how it's been in Sydney this weekend. As I'm writing this, the rain is battering my window, ushering me back into my bed. Alas, there is work to be done. For me, it was welcome to Ramen Kan. 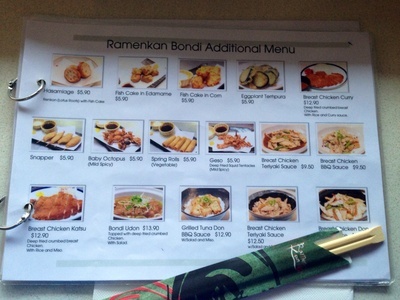 There is always more room for cheap and delicious ramen bars in Bondi Junction, with more and more people flocking to the district to get their retail therapy. Just out of Westfield Shopping Centre sits this unassuming restaurant where bar stools sit at the front, and a communal table takes up the middle of the room. 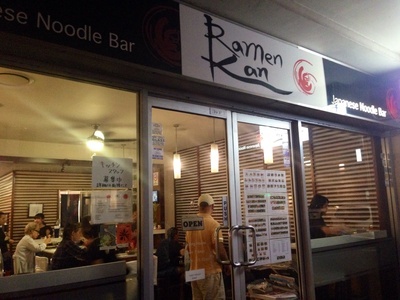 Ramen Kan is conveniently located just outside Westfield, Bondi Junction. The boyfriend and I have begun to enjoy this as our pre-movie feed for date nights, as the four pages of pure entrees makes for deliciously filling snacks as alternatives to the usual popcorn and chocolate (who am I kidding, we still get that too). We like to sit on the bar stools at the front of the restaurant, of which are surprisingly comfortable, and provides us with the entertainment of people-watching. 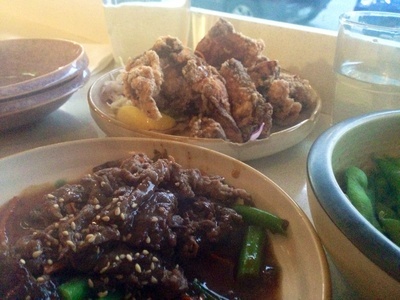 The entrees starting at $5.90 are sizeable, and two of each filled us up entirely. He went for Chicken Karaage and Teriyaki Beef, both of which were well seasoned and cooked, while I went for Tempura Eggplant, which was very light and crispy, and was served with a soy and ginger dipping sauce; and Agedashi Tofu, which came with four massive pieces of tofu, more than I'd ever received anywhere else. This was enough to share, but I managed it myself. 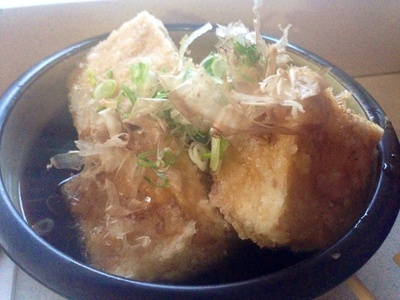 The tofu was not the crunchiest I've had, but still ticked the box. 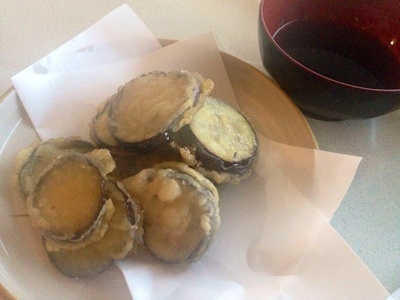 We also shared some Edamade, which was served hot with sea salt. It can get busy in a second, it seems, with the restaurant partially empty on arrival, but filling up as our food arrived, which took no time at all may I add. But what of the ramen? As a vegetarian, I was sadly surprised at the lack of flavour in the one vegetarian option. I honestly think I could get more out of a stock cube. I would recommend walking around the corner to Ich Ban Boshi, as their offering always leaves me coming back for more. 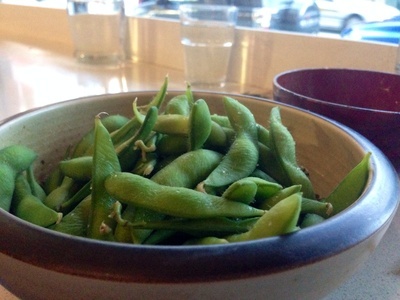 As to Ramen Kan's more carnivorous servings, I've heard only positive reviews. This restaurant is recommended to those who crave a comfortable warm shelter on a rainy day, and who like to enjoy delicious food on a budget. It's simplicity at its best. Ramen Kan, keep it coming.